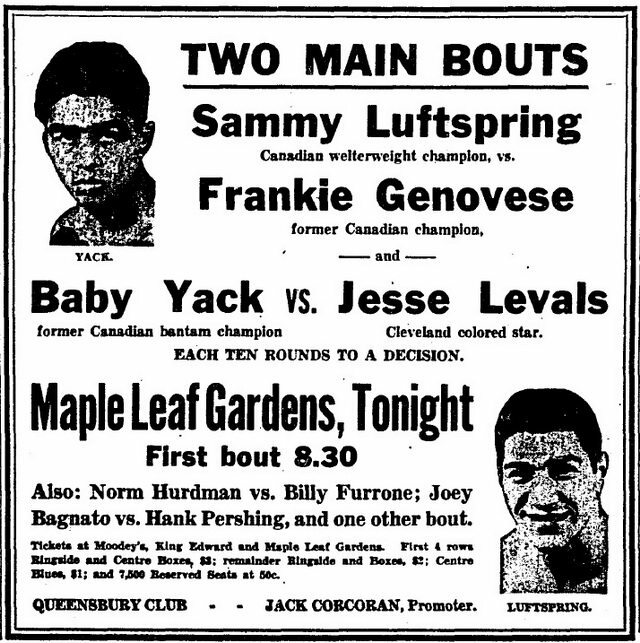 Before the Pan Am Games, boxers Sammy Luftspring and Frankie Genovese gave Toronto world-class competition. Crowd at a boxing match, Maple Leaf Gardens, ca. 1940s. From the City of Toronto Archives, Fonds 1257, Series 1057, Item 7518. In the 13th round, the advantage had swung to the hard-hitting “Sockin’ Sammy” Luftspring, but as they stared each other down in the boxing ring, Canadian welterweight champion Frankie Genovese wouldn’t relent. Genovese had started strong, with his characteristic aggressiveness, harassing Luftspring with left jabs. Now, only his “instinctive fighting nature kept him going,” as one reporter noted. Time and again, he was knocked to the mat that round; and time and again, he staggered to his feet to face his bitter rival. The October 3, 1938, fight—when Luftspring supplanted Genovese as titleholder before a huge crowd at Mutual Street Arena—was hailed as a classic, and the culmination of what boxing historian Murray Greig called “one of Canada’s best-ever ring rivalries.” Both fighters, Toronto-born, were among the best welterweights in the world, and their four “catch-as-catch-can, no holds barred and anything goes” match-ups, captured the city’s attention in the late 1930s. Whenever Luftspring and Genovese fought, it was “the pride of the Jewish ghetto up against the hero of Little Italy,” as Luftspring recollected in his autobiography. And partisans from each’s home neighbourhood turned out in droves. Sports, Luftspring recalled, was the only thing that could draw Toronto’s Jews and Italians—separated from the Anglo-Saxon mainstream by language and religion—out of their self-sustaining neighbourhoods to mix with the WASPs who dominated the city’s economic, political, social, and sporting institutions. With neighbourhood (and ethnic) pride on the line, the passion of fans debating the outcome sometimes boiled over into street fights. 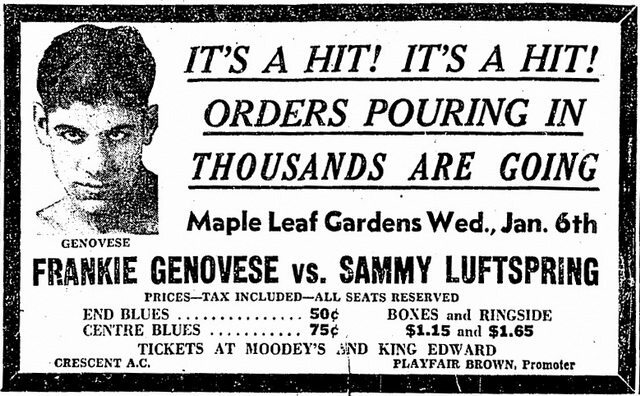 The first time Genovese and Luftspring met in a boxing ring—at Maple Leaf Gardens in early January 1937—was hotly anticipated and hyped as the first time in nearly a decade that a pair of home-town fighters headlined a boxing card. 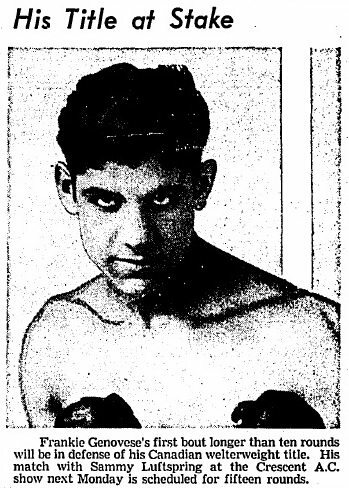 Boxing’s popularity had peaked in the late 1920s when lightweights Steve Rocco and Albert “Frenchy” Belanger regularly drew 4,000 to 8,000 or more to their fights. 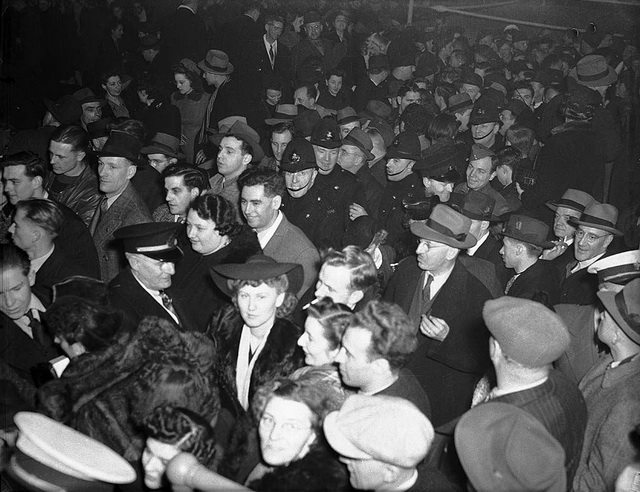 Crowds were composed of both the wealthy—some of whom attended in evening clothes—and the blue collar residents of Toronto’s new immigrant communities, The latter relished cheering boys from their own neighbourhoods in the ring since the vast majority of fighters in the inter-war period were drawn from the Jewish, Italian, Irish, and Slavic working class. The sport’s popularity had dipped in the early 1930s, when listless boxers diminished the quality of local competitions. But the emergence of a rivalry between Luftspring and Genovese, two tremendous welterweight talents, promised to reinvigorate the local boxing scene. “In the ghetto, a kid gets used to punching noses just to keep from getting the same done to him,” Luftspring recalled in his memoirs, explaining why so many boxers came from impoverished backgrounds. “If his victory average is high enough, finally it filters through the lumps on his head that he could make a living at his survival skills.” Born in 1916 to Polish immigrants, then living on Elizabeth Street in The Ward, Luftspring grew up in the predominantly College-Spadina neighbourhood. Luftspring’s father, a bootmaker in the Old World, supported his family of nine children as a bootlegger, making a tidy living at it until being devastated in the Great Depression. As a shy and under-sized kid, Luftspring was bullied by a classmate at cheder until he earned a reputation as a playground scraper with lightning-fast reflexes. He really got hooked on boxing, though, when he attended his first fight card at the Leonard Athletic Club, a dingy, second-floor boxing club at Queen and Spadina, with his father in 1925. With few entertainment options for the working class, locals—and gamblers—attended “smokers,” named for the cigar-filled atmosphere, staged at neighbourhood boxing clubs, parish halls, and nightclubs. For a half-dollar, they could watch a slate of amateur and semi-pro bouts. Luftspring was impressed by the adoration poured upon the boxers, most of whom were neighbourhood teenagers hoping to make enough impression to be called up to a bigger, city-wide card to fight against kids who’d come up through smokers in other neighbourhoods. Though smokers weren’t part of a boxer’s official record, by the time a local boy made his amateur or professional debut on a big card at Mutual Street Arena or Maple Leaf Gardens, Luftspring reported, he was usually already well-known and drew large crowds “because he would have picked up his rooting section from the smokers in his home neighborhood.” He wanted the same for himself. Hard work and physical prowess in the boxing ring offered Luftspring and Genovese—members of immigrant communities then looked upon with suspicion or hostility—a measure of acceptance by Toronto’s mainstream, just as boxing has historically provided an avenue of social mobility for the ethnic minorities elsewhere. It was a means of escaping the low paying, low prestige occupations available to them. Outside of boxing, Luftspring’s only jobs had been on the edge of the law, acting as a lookout for his parents’ bootlegging operation and as a runner for bookmakers operating outside Long Branch racetrack. With little education and systemic barriers to Jews becoming teachers or even sales clerks, Luftspring seemed destined to work in the needle trade—which then employed about a third of the city’s working Jews—just as Genovese seemed destined for the construction field, a predominant employer of Italians. Earning money came later, only after they turned professional. As amateurs, the only compensation Luftspring and Genovese could officially receive were medals, trophies, or, at best, a cheap watch they could quickly hawk to a pawnbroker. Luftspring recalls sometimes managing to convince promoters “to dispense with the middle man, and just give me the two bucks.” He had little affection for the amateur code that Toronto’s Anglo-Saxon elite promoted so strictly. “I was expected to go into the ring a hundred times to risk getting my head removed from my shoulders,” he complained, “for something called the glory of sport.” To compete in the 1935 Canadian Championships, for example, Luftspring—who started off boxing in old running shoes and swim trunks, the only outfit he could afford—was expected to scrape together enough to cover his own travel expenses to Edmonton. 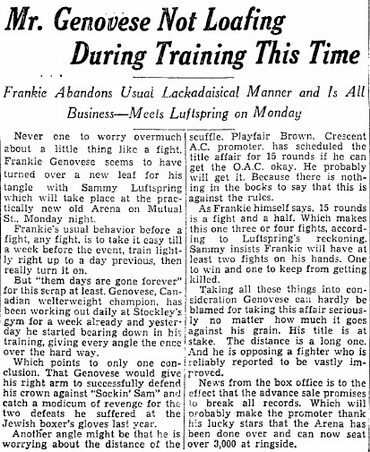 Eventually boxing as an amateur locally and across the American Midwest, Luftspring claimed that he and his opponents received $35 or $40 under the table to cover travel expenses—a practice that eventually earned him a four-and-a-half month suspension in 1935-1936. For a time, he even boxed as a professional in Chicago under an assumed name without being detected. Frankie Genovese may have fought unsanctioned bouts, too, including at least one savage, bare-knuckle prizefight for the gamblers and bookies outside Long Branch in 1932. In his two short years as an amateur boxer, Genovese earned accolades and titles, and reached the semi-finals of his division as a 90-pound 16-year-old at the 1932 Olympics in Los Angeles. But what he really wanted was to earn enough money to buy his mother a house, and he turned pro shortly after returning from the game. Over the course of his career, he made little secret of his financial motivation. In the 1930s, Toronto was a city divided by ethnicity. “The Chinese didn’t mix with the Jews, the Jews didn’t mix with the Italians—and nobody mixed with the WASPs,” Luftspring writes in his memoirs. Ethnic rivalries was a fact of childhood for he and Genovese, at a time when a simple softball game could erupt in the ethnic violence of the Christie Pits riot. Being on the receiving end of racist slurs sharpened their sense of Jewish and Italian identity, prompting Luftspring to embrace his roots in the most overt way possible: he stitched a big Star of David onto his boxing shorts. When Toronto’s foremost promoter, Playfair Brown, finally succeeded in signing both boxers for a ten-round fight at Maple Leaf Gardens for early January 1937, he hyped it as “a grudge battle between two evenly matched boys.” Other than Luftspring, then still an amateur, serving as Genovese’s sparring partner two or three times, the two had never met in a boxing ring. But from press accounts, there already seemed to be bad blood between them. Debate raged among local boxing fans about who would win. Genovese, the far more experienced of the two, was reputed to be a mean boxer and had, it was rumoured, been fired as Henry Armstrong’s sparring partner during a recent stint in New York City because he was causing the soon-to-be world featherweight champion too much trouble in the ring. Genovese was, Luftspring admitted, “the Toronto welterweight against whom all of us were measured.” Few observers thought Luftspring, a lean fighter, could withstand a heavy, sustained barrage from Genovese. On the other hand, consensus was that Luftspring was a harder puncher and in better shape than the Italian, who’d earned a reputation for shirking hard training in favour of enjoying the city’s nightlife. A crowd of 5,100 was there for the opening bell, when Luftspring, known as a counter-puncher who cautiously avoided blows and awaited an opening for counter-attack, surprised Genovese with his aggressiveness for the first six rounds. When Luftspring laid back in the seventh, Genovese, who was known for his strong finishes, seemed on the verge of a comeback rally, pummelling Luftspring with body shots and upper cuts. “The toughest welterweight fighter in town took it for the eighth round and again for the ninth,” Luftspring recounted his renewed, late-round aggression in his autobiography. “But that was it. He couldn’t come out for the tenth, and I had beaten Frankie Genovese by a technical knockout.” Bleeding profusely from a cut above his right eye, Genovese gamely tried to return to the fight, but was prevented by the athletic commission doctor. “It was by far the best pro bout that Toronto has seen in many a moon,” Hal Walker assessed in the Globe and Mail. Almost immediately there were calls for an encore against Genovese. 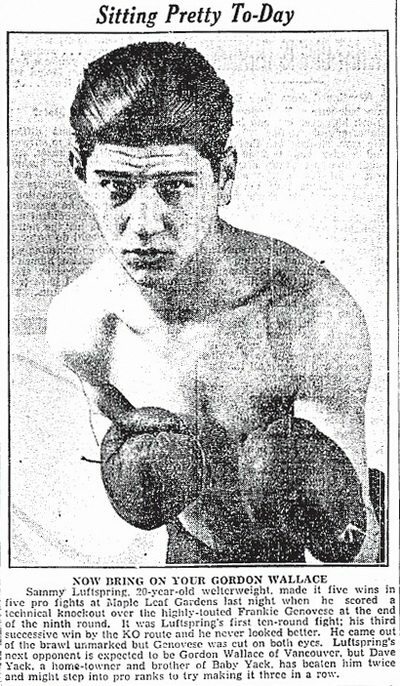 Before the rematch, however, and after a few more bouts, Luftspring faced Gordon Wallace for the Canadian welterweight title in early April 1937—a remarkable opportunity for a boxer only seven fights into his professional career. It was a disaster. Trying to limit the effectiveness of body blows from the hard-hitting Wallace, Luftspring “elected to run, to attack in spasmodic flurries, to cling and hang on like the trailing arbutus,” complained one journalist afterward. By the end of that month, fulfilling popular demand, Luftspring was back in the ring against Genovese at Mutual Street Arena. Both had chips on their shoulders. Eager for revenge, Genovese trained hard, reporters said, and slept instead of carousing late into the night. 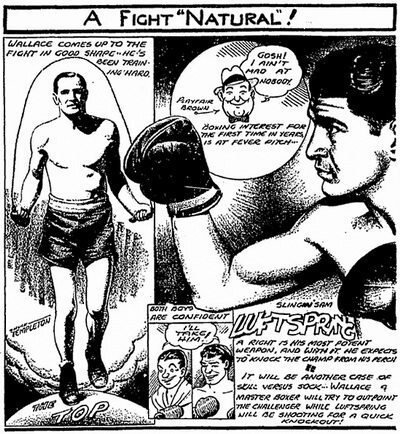 Luftspring was still believed to be in better condition, but his debacle against Wallace had solidified his reputation as “Kid Cautious.” After an evenly matched fight before more than 5,000 spectators, Luftspring was declared the winner over Genovese on a split decision after ten rounds. But the press and the public, in even numbers, agreed and disagreed with the judges. The rest of the year proved disappointing for Luftspring. Once adoring boxing fans turned on him, their enthusiasm no longer fired by his bouts. The once fawning press dubbed him “Bicycle Sammy” for his elusive—even mild—fighting style. He’d long harboured ambitions for higher things, but now losing confidence, he decided he’d gone as far as he could on talent alone. Seeking first-rate coaching, he headed to New York in the winter of 1938 and signed on with Al Weill, a prominent boxing manager who, it later turned out, had underworld connections. Weill was variously described as “bad-tempered,” “unscrupulous,” and “a genius” by Luftspring, who adored and feared him. But Weill saw in Luftspring a contender to fulfill his lifelong ambition for a Jewish world champion. Ambitious but willing to learn, Luftspring soaked up everything he could from Weill’s first-class trainer, claiming to have learned more in his first two weeks in New York than in years of fighting in Toronto. Rattling off seven straight victories—three by knockout—in the U.S., Luftspring emerged as a more confident boxer, eschewing his earlier back-pedalling for a more free-wheeling style. 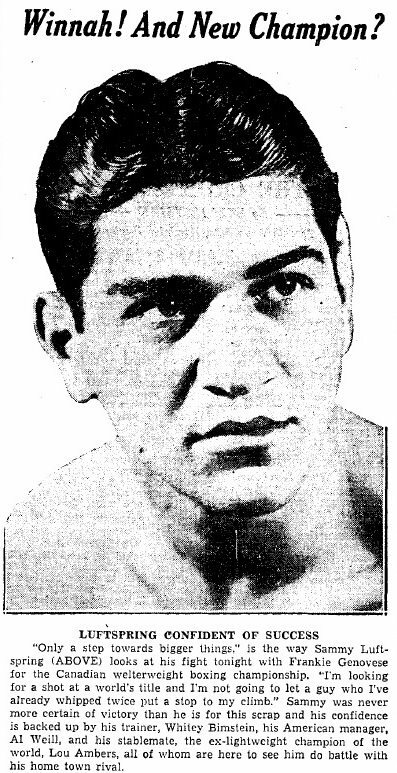 Meanwhile, Genovese had snatched the Canadian welterweight crown from Wallace in May 1937 and successfully defended it a number of times in the ensuing months. However, the temperamental boxer came to be seen as something of “a prima donna” by reporters who witnessed him verbally berating his managers. Critical sportswriters didn’t think he’d defended his Canadian belt often enough—opting instead to face American and international competition. 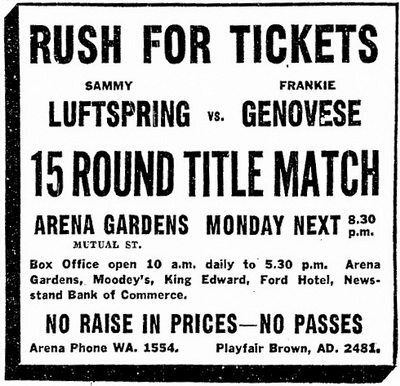 They were vocally clamouring for a title fight, not against the country’s number one welterweight contender Tommy Bland, but against Genovese’s great rival, Luftspring. They got their wish with a 15-round bout—the first in Ontario’s history—scheduled for October 3, 1938, at the newly renovated Mutual Street Arena. As always for fights between the two, interest was high, and advance tickets sales broke box office records. Luftspring, who labelled it “the very best fight I ever had,” was awarded a technical knockout, though Genovese’s ardent defenders continued to believe that, had it been a regular 10-round fight, their fighter would have won on decision. Perhaps more rewarding than being crowned the Canadian welterweight champion, Luftspring wrote in his autobiography, was the resulting approval of his fiancé’s father, who finally consented to her marrying the boxer. 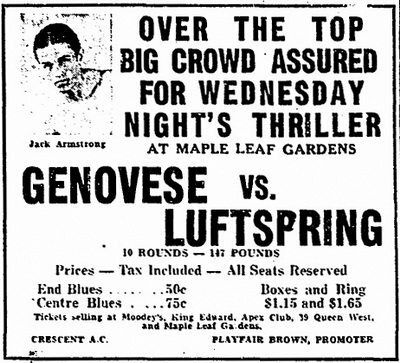 Three weeks after the wedding, Luftspring defended his new title against Tommy Bland at Maple Leaf Gardens. What he really wanted was a shot at the world welterweight title. But this rematch—for which Luftspring’s title wasn’t at stake because the Italian was overweight—was a shadow of their earlier rivalry. The fight was clearly more important for Genovese, who’d just dropped a colourless fight to Billy Furrone of Syracuse, and needed a victory to revive his stagnating career. Luftspring, who admitted being “world-title hungry” and having his eyes on his next fight, arrived with little advance training. Despite being in good condition, Genovese was over-matched, reporters observed. “Luftspring has developed a terrific punch and is cool as an icicle in the heavy firing,” the Globe and Mail reported afterward. “He had a wide advantage.” Luftspring won on decision. Luftspring’s still-rising career was over just a few fights later. He was on track to finally get his crack at Henry Armstrong’s world welterweight title in 1940 when, early in a bout with Steve Belloise in the Bronx that May, he suffered an eye injury on a seemingly harmless jab. Refusing to concede a technical knockout, he continued to fight, only to find out afterward, he had suffered a detached retina. He never boxed again. With no real savings accumulated from his boxing career, Luftspring worked a variety of jobs before finding success as co-owner of the Mercury Club, and returning to the ring as a long-time referee. He died in 2000. After retiring from boxing in 1944—without ever losing another bout—Genovese became a businessman and sometimes boxing manager. He died in 1998. The rivals injected pride and passion into the local boxing scene—with their die-hard neighbourhood cheering sections—in the late 1930s. But, assessing their legacy, sportswriter Ralph Allen counted both Luftspring and Genovese as members of “the valiant list of local boys who fell one big ‘if’ short of making good” and winning the big one—the former because of his eye injury, and the latter because of a character flaw that kept him from training hard enough to reach his full potential. Over the course of the 1940s, the spectre of corruption hung over North American professional boxing, and the sport’s popularity declined. The regular fight cards, with an abundance of local boxers, no longer captured the imagination of Toronto spectators, though fight fans still turned out for elite-level, international bouts. Maclean’s (October 9, 2000); and the Star (June 15, 1935; November 27 & 30, and December 1, 8, 11, 22, 29 & 30, 1936; January 2, 5, 6, 7 & 9, March 16, April 2, 3, 17, 20, 21, 23, 26 & 28, May 1 & 5, 1937; July 2 & 27, August 29, September 3, 26, 27, 28 & 29, October 1, 3, 4 & 15, November 26, and December 10, 1938; February 14, 20, 21, 25, 27 & 28, 1939; February 21, 1998).